The 3-0 lead nearly didn’t survive another perilous ninth inning from closer Fernando Rodney, but the improbable 3-1 triumph over a stripped-down Angels lineup moved the Mariners within one game of the Oakland Athletics for the second American League wild card — and provided the first winning season (82-70) since 2009. Oakland (83-69) Thursday afternoon fell victim to a three-game sweep by the Rangers. That dropped the A’s a half-game behind the idle Royals (84-69) for the first AL wild card. The Royals open Friday a critical three-game series with the AL Central-leading Tigers. Much credit fell on the broad shoulders of Morrison. The 27-year-old first baseman came to the plate with his teammates having managed five hits after a shutout Wednesday. 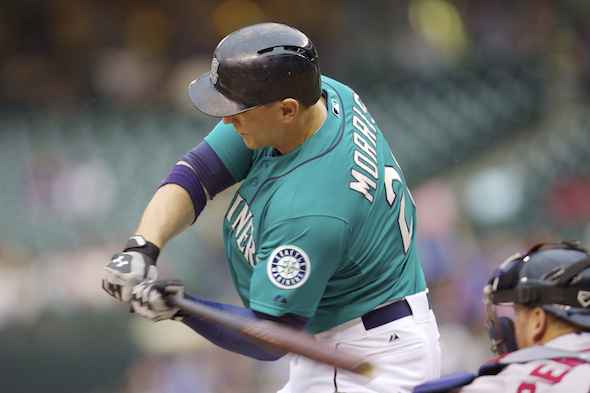 With two hits Thursday night, Morrison improved to 8-for-16 with two home runs over his last six games. His hot bat saved Seattle from losing a second consecutive game pitched by Felix Hernandez, and permitted a split of the four-game series with LA, the AL West Division champs with the best record in baseball. Facing a lineup that looked more like the Angels AAA affiliate Salt Lake Bees, Hernandez did what one expects from a Cy Young-caliber pitcher — dominate. Over seven shutout innings, Hernandez (14-5, 2.07 ERA) held the Angels to three hits while striking out 11. The K’s gave him a career high 236 on the season, surpassing the 232 he had in 2010. Manager Lloyd McClendon decided seven innings and 97 pitches were enough, lifting him for the 14th time after seven. Not coincidentally, Hernandez garnered his 13th no-decision. McClendon brought in Charlie Furbush and Tom Wilhelmsen to pitch a scoreless eighth, albeit with hiccups. Wilhelmsen notched a fly ball out to strand three runners and maintain a scoreless game. In the ninth inning, a two-out Kendrys Morales single made possible Morrison’s theatrics. James Jones came on to pinch-run, and a bad pick-off throw by reliever Kevin Jepsen sent Jones to second. That forced an intentional walk to Kyle Seager, bringing Morrison to the plate. Morrison said he anticipated an off-speed pitch, and got one middle-in. He didn’t miss it, delivering the biggest hit of his career. In the ninth, Rodney gave up a solo home run to Hank Conger, then allowed a runner when he failed to catch Morrison’s throw to first after a grounder. But he struck out Tony Campana to secure his club-record 46th save, few more harrowing. The Mariners struggled all night against another spot starter, Wade LeBlanc, a 30-year-0ld journeyman most recently with the Yankees. He received his second start of the season when manager Mike Scioscia scratched scheduled starter Jered Weaver a night after the team’s division-clinching celebration. He also rested stars Mike Trout, Albert Pujols and Howie Kendrick. LeBlanc limited the Mariners to three hits over 5.1 scoreless frames before taking his leave. His high-80’s fastball and slow changeup played up thanks to a generous strike zone from home plate umpire Bob Davidson.